Everyone wants to know who they’re doing business with and if that new client, a certain Mr. Bradly Cooper, or Ms. Angelina Jolie, is the real deal. 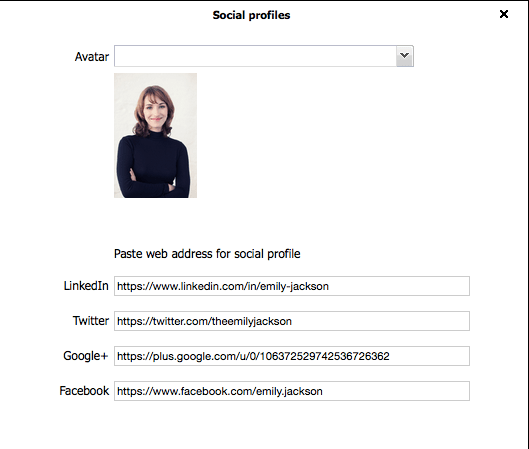 The social profile feature allows a user to add a link to social network profiles and upload avatars directly from the system. Then try clicking the avatar and … what’s this? Solve will allow the user upload an image for their contact and also present a short-list of different social networks, which can be filled out by entering the web address directly in the provided field(s). Once the profiles are set, you can quickly jump to the contact’s social network page(s) by clicking on the icon beside the contact’s name. An avatar (contact photo) is online persona that says something about how a person wants to be perceived. Photos aren’t just hoo-hah, there’s some science behind this feature. An accompanying image engages your visual senses and establishes a new dimension to your relationship with your client. It adds personality to those “records” and sets the stage like you’re interacting with a real person. Tying an avatar to a contact naturally promotes a more human interaction and builds trust, enhancing your client relations. That’s the business we’re in! …okay, it’s kind-of cool too. An avatar can be updated simply by uploading an image from the system, similar to changing the logos for project blogs. For each social website filled out, the system will automatically create the appropriate social icon beneath the avatar.